Hello! 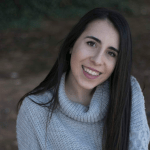 My name is Andrea, I am from Valencia, Spain and I would love to be your new Spanish teacher! I have a degree in Translation and Interpreting, and I want to help you in this process of learning Spanish. My classes focus on improving your fluency as well as clarifying your grammar or vocabulary doubts. I invite you to take private lessons with me. ¡Te espero! Focus in communication and speaking skills.